I’m so excited to show you a finished quilt! I was thrilled to have the opportunity to work with Jenean Morrison again, this time using her newest line of fabric, Wild World. This new line is a gorgeous mix of florals and fun geometric shapes in a really lovely softer color palette. You can read more about her inspiration for this line here. I thought that the smaller scale designs would lend themselves well in a string quilt, and together we decided that a quilt similar to my original wonky string quilt would work well. I used 11″ squares this time so as to show off larger pieces of Jenean’s fabrics. I initially couldn’t decide what solid color to use for the center strings. I considered white and also gray, but since I’ve used both in the past, I decided to go with this warm stone color, which I think is a great compliment to these prints. For the backing I went with Kona Artichoke, which is one of my favorites. And of course, for a little something fun on the back, I pieced together a couple small striped sections using a few of the leftover prints. This quilt will be displayed in Jenean’s booth at Quilt Market. If you’ll be attending this year, be sure to stop by booth #729 to say hi and take a closer look at this great new line! And now, a little something for you! I have several pieces and smaller scraps of these fabrics left over, and Jenean has generously offered them to one of you! Comments are now closed. I’ll select and post a winner shortly! 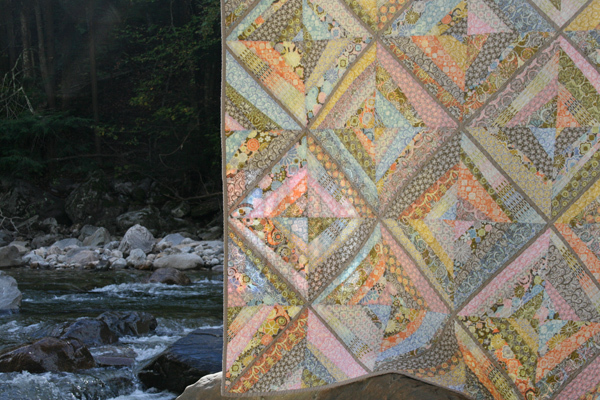 This entry was posted in [search] Wonky/Improv Quilts, 2010 Finished Quilts, Finished Quilts, Posts about Quilts, Quilts and tagged freespirit, handmade, jenean morrison, quilt, quilting, string quilt, wild world, wonky string quilt. Bookmark the permalink. Such pretty colors! I actually just finished a quilt for my niece’s birthday using California Dreamin’. She loved it. Right now I am ready to sew on the binding of a tree skirt I am working on. I love it! I ‘m working on quite a few quilts, including one that’s for a school auction. The stone solid was a perfect choice. The quilt is lovely such different tones than you normally use I’m sure it was a nice change. Beautiful work as always!! Lovely quilt! I’m working on quilting a crib-size quilt this week and planning an anniversary trip to Fallingwater. Gorgeous quilt, I especially love the photo where you can see the silhouette of the person holding it with the light behind. Thanks for the giveaway! This week I’m working on a mini quilt and a bag (both gifts for friends). I’m working (in theory) on a quilt for our baby that is due in March. And a favorite fall activity is eating apple cider donuts, ahem, I mean going apple picking! I would love so much to be able to make a quilt to go to market one year! My favorite fall activity this year is waiting for my baby to come – less than 6 weeks til due date now! I’m working on a baby quilt for a friend that is in the process of adopting a little boy. I hope to have it finished before they come home with him. this week i’m working on quilting a wonky square in squares quilt for my friend’s wedding gift. thanks for the giveaway! I love the muted colors of the line!! This week I’m hoping to finish a fall-inspired quilt for my in-laws for their new mountain home! This week i am cleaning my crap I mean sewing room. I love being with family, and doing fall activities. Love that quilt. You two made a great team. Gorgeous quilt!! That fabric line is so beautiful. Thanks for a great giveaway!! I am working on kitchen curtains and painting a bathroom this week. Sadly, no quilts for a few days! Love this palette – so different and soft. Thanks for the chance to win – I love scraps! This week I am working on getting a baby quilt for a friend quilted and bound. I love to go on walks to see the foilage, but ours is just barely starting to change here in NC – another 2 weeks and it will be gorgeous! What a beautiful way to blend such extraordinary fabrics! Nice job. I was hoping you’d comment on your “support” behind picture 5 🙂 . Your pictures are always taken in such beautiful settings, I’m so jealous. Was it morning when your pictures were taken? I’m working on some towels to give away as Christmas gifts using your great tutorial! I really like this new fabric. I’m planning on starting a baby quilt for my cousin’s baby that is due in December. It’s going to be an ocean themed quilt and I’ll be using some Aldo to Zippy fabric. This week I am working on some papers for university which technically were due about a year ago (I got an extension until in a week…) and therefore can’t do any sewing. I already miss it! 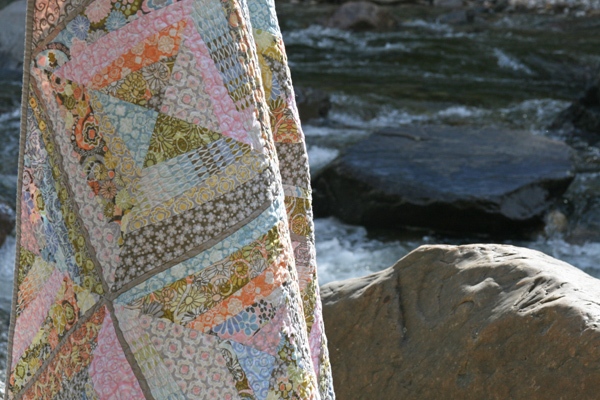 Beautiful Quilt, and I love that line of fabric, if I don’t win, I’ll be ordering some! It’s been a beautiful Thanksgiving weekend up here in Canada! Lovely walks in the bush, nature trails with my kids. Hopefully this weather lasts, because we plan on going for night nature walks every night! Beautiful quilt! I’m trying to finish some really old projects before I break into some new ones! I love the silhouette behind pic 5, too! The last one looks like (he?) risked his life for that beauty of a quilt!! Amazing setting! This week I’m starting a quilt with raspberry, chocolate and golden colors. Love fall . . . This fabric is beautiful! You always showcase such lovely fabrics and your quilts are fantastic. I am slowly trying to work back into sewing this week…morning sickness during pregnancy really throws me a curveball for several weeks. On the list: Christmas presents! Beautiful job… love the quilt photo shoot also! I love your wonky string quilts, and this one is no exception. My list this week: finish up the top of a red/pink/aqua apple core quilt. you inspire me! i just want to quit my job and stay home and sew all day!!! thanks for the great show and tell! That is such a beautiful quilt and the fabric is just lovely! Hope your feeling well. Hopefully this week I can finish the quilt I’ve been procrastinating on! What I’m working on this week: Cutting out pieces for two Anna Maria Horner “Here We Go” bags (from “handmade beginnings”) for soon-to-be new mamas to use as diaper bags. I love those soft colors. My next quilt is going to be a wonky one. I have been seeing them and really like the freedom of not matching seams. Lovely. .thank you sharing what you can make with fall-ish colors. Beautiful quilt! I’m working on a swap project this week, plus some other secretish, exciting things…lots to do! This week I’m going to be working on the twin quilt I’m hand-piecing, and on being a good teacher. It’s a constant battle. I love the fabrics you used, as well as the stone-colored fabric for the backing. I think one of my favorite photos is the one with the silhouette of your helper holding up the quilt! Thanks for offering this wonderful and generous giveaway. I’d be honored to win it. I just started an eye spy quilt for our expected baby. I got the eye spy charms from diary of a quilter’s etsy shop. Super adorable! Oh! And I joined my first flickr bee over the weekend, so I’ve been getting my flickr account spiffed up. Thanks for sharing! I love string quilts anyway and that fabric gives it a watercolour feel. Really lovely. oh, my! what a lovely quilt — especially the dreamy colours. i’ve been working on my own (softer) version of your farfalle quilt (with tea-dyed blocks instead of your white). way too much fun! What a beautiful quilt! I’m loving this soft color palate. I’ve been doing a lot of sewing for my daughter lately. I just made her an adorable Halloween dress, which you can check out on my blog. I’ve got a ton of awesome children clothes patterns if you need any recommendations!! Oh I just love pastels! This week is soccer games and extra meetings at night. Hopefully, the apples on my tree will be ready for applesauce by the weekend. Love the new quilt! I’m working on knitting a sweater for a new baby grandaughter. Turquoise and brown, and it has a beret to go with it, so cute. I’m also working on a hexagon quilt that these scraps would be great in. I’m working on a few quilts for Christmas presents right now. I love that fall is coming, but our leaves haven’t started changing yet. I really enjoy the soft color palate of this line. This week’s fall activity is completing siding and enjoying the last dregs of the beautiful fall weather we’ve been enjoying! Oh, and yes, I need to get started on a few (more) quilts. beautiful again ashley, love the artichoke backing especially. the prints are gorgeous! This week, I’ll be working on a baby quilt for my friend, Mary. It’s cute fabric with kites on it (which she may need because this is her fourth baby in five years!). Lovely quilt! This week I’m working on a baby quilt for one of the Drs I work with. She’s due in March, so I’m starting now! 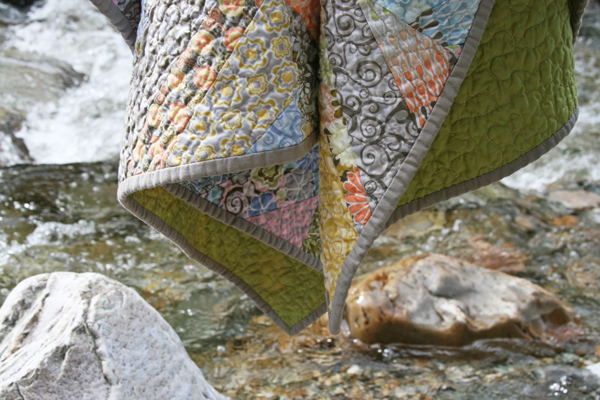 It’s a charm pack quilt of Fig Tree’s Whimsy. Very nice! I’m working on 2 nursing covers, 2 baby quilts, and a purse this week. And this fabric would come in handy! Thanks for sharing. VT fall foliage road trip…now that sounds fun to someone that’s sewing and quilting and binding and packing for PIQF, Santa Clara, California quilt show…..thanks for the giveaway! It would be fun to sew for fun! Lovely as always! This week I’m going to start a new baby quilt for a lady at church. I’m also going to the Georgia Quilt Expo this week! yeah! Love the quilt! I am sew small things for teachers gifts…trying to get a jump on Christmas gifts! Oh its a stunning quilt!!! love that collection of fabric too! Gorgeous–I love that quilt design and think these soft colors make it so cozey looking! I’m desperately trying to finish proofing a few weddings so I can make a Dream On quilt this week…but I’ll probably end up running late and only getting to sew Halloween costumes! I hope to be working on something/anything this week. It’s difficult for me to work on projects during the week after work. My favorite fall activity is to go on vacation. I live in Florida and there isn’t much of a fall season here. We like to go to the Smokey Mountain National Park and get a real dose of fall! i love the slower pace of fall,(more sewing!yay!) and making pumpkin goodies! Beautiful colors! We celebrated Thanksgiving this weekend and did lots of leaf raking! I’ve been slowing down a little with fall and started some hand quilting. I’m enjoying the change of seasons. Oh my. You did a wonderful job spotlighting her new line. I’d love to give it a try. I’d also like to tool around VT and look at the fall foilage but that won’t be happening. Fortunately, I have to attend a conference in Portland, OR next week so I may get to see some fall colors. At home here, we are supposed to hit at least 87 degrees today. Where is fall?? I’m still working on my Jane Stickle quilt…thanks for the chance! Great colors in your quilt! I’m working on finishing my Charm Pack quiltalong from Freckled Whimsy – I got some great Deer Valley charms to use for that! I started late so I’m behind but can’t wait to see it completed! Fall is my favorite time of year! Cider mills, driving Michigan backroads enjoying the colors, raking and burning leaves….the list goes on and on! Thanks to you and Jenean for the giveaway! It’s a beautiful quilt! I love how soft it looks. I hadn’t seen Jeann’s new collection, which looks gorgeous. I love her inspiration, and hearing that she did more hand work than computer generated art with this one. I’m working on a new messenger bag for myself right now. My favorite fall activity is definitely hiking! Hi! Your quilt is just lovely! This week I am working on a lap quilt for me, some blocks for exchange for my quilt guild, and maybe a few Christmas presents if time allows! Thanks for hosting the giveaway! I would love to be traveling through small towns in Vermont too. But I’m here in California. I would love to drive through little towns and check out the foliage – if I didn’t live in Southern California. No foliage here. But I do love to walk on the beach early in the morning especially if it’s foggy. Kind of reminds me of a real fall weather (fall is my favorite season). The quilt is beautiful. Love to see the soft colors. Love these wonderful colors, so soothing. And the string block is perfect way to show them all off. thanks for the chance to win, I worked on a baby quilt this weekend, Dr seuss! I love all your quilts. So inspiring. You did a wonderful job of using this new line and I love the look. Can’t wait till the line is released! This weekend is Thanks Giving Weekend in Canada so I was cooking, baking and enjoying family. The fall colours are amazing right now and the sun is warm. My favorite thing right now is to walk my new puppy and curl up under a quilt by a fire at night. Very soft and pretty! And congrats on the baby!!! This week I have to bind a quilt in time to enter it into my guild’s show. I have 2 days left – yikes! This week/weekend I’m making stuff for the ‘Aforadable Art Fair’ in my city. It’s on Sat, and I’m rushing to get it all done! Beautiful fabrics and quilt!! The colors have been at peak the last couple weeks here in Minnesota – I wish Fall would last for a few more months. I’m finishing up a Christmas quilt for myself that’s about 3 years overdue, then it’s on to Halloween costumes for the kids (kind of backwards on the order of things, I know). The softness of these colors and the beautiful prints are wonderful! Your string quilt is amazing. I only just recently made some string blocks for a bee and I’m hooked! More are definitely in my future. Right now I’m working on a fun Castle Peeps quilt for my son as well as piles of Christmas presents that will hopefully get done for THIS year. Oh, and finishing up the Halloween costumes, of course. Can’t send the kids out capeless for Halloween. it’s a beautiful quilt and scenery! wow! I’m trying to finish up a bunch of quilts in my unfinished projects pile. I’m hoping to start the new year off without so many projects to complete! I love to walk around with my new camera to take pictures of this wonderful fall we are having. These days I am binding my last quilt, made with Amy Butler’s Midwest Modern. It should be finished very soon. Thank you for the opportunity to win. Your quilt looks amazing. love the quilt! love the soft colours, very pretty! today is the canadian thanksgiving and i’m making my very first turkey. we’ll see how it goes… thanks so much for the giveaway! That picture of Morgan is hysterical! Conveniently enough, I’m working on some scrap projects… Honestly, I am. I like the solid you chose for the front – what did you call it…warm stone? love the name. It looks like that is also the binding, right? Well we’ve already hit the pumpkin patch and the corn maze, so this week we’ll be seeing the Odyssey Dance Theater do their Thriller show. I’m hoping it becomes our newest Halloween tradition! Beautiful! This week my goal is to finish a modern art inspired lap quilt for my friend. we’ll see how that goes. fall is my favorite season! i can now make and eat soup without sweating. thank you for this chance to have some pretty new fabrics! Great quilt! I love these fabrics, and they look great with the wonky string quilt design. This color palette is right up my alley. Love the change of pace. I’ve been looking for the just the right quilt to make for my son–using browns and blues and fall-ish colors. This will be perfect–thanks for the inspiration. I so love the colors in that quilt, what a beautiful line. I am working on a UFO that is just so boring I try to get a little done between quilts. That’s why I’m checking blogs, avoidance. Love the subtle colors in the quilt! I am working on a huge lap quilt for my very tall husband (Christmas gift). I love baked pies and hot soups and stews in the fall – as well as photographing all the beautiful fall colors! What a beautiful departure from bold colours. Calm and pretty. Lovely! The fabric and the quilt! Thanks for the chance to win! I love the quilt!! I’ve been working on a lap quilt for my mother, a lollipop design, with free motion quilting. It’s taking a while! Beautiful! As always. I bought a “bliss” charm pack and have been dreaming about a little quilt. Also finishing up some hexie pillows for my couch and maybe making something Halloween-y. Thanks for the chance. I’m catching up on bee blocks! I’m working on my swap partners gift for Modern Swappers 2 on Flickr! Beautiful Quilt as always Ashley! Thanks for a chance at the scraps! Oh, I love this fabric and I love it with gray. Thanks for this opportunity!!! I am working this week with some of the ladies to design a raffle quilt. Ooh, I love this line!! Beautiful soft colors! I am trying to finish a very large quilt for my daughter and I also have several baby quilts in the queue. The International Balloon Fiesta just finished up here in Albuquerque; always a wonderful start the beautiful autumn here. I just took the front off of my 2 year old’s crib, so this week, I’ll be working on keeping him in his own bed. 🙂 Hopefully I’ll get to work on some Christmas projects this week. It’s getting closer, you know?? Beautiful quilt and fabrics! I’m working on a checkerboard quilt – very little boy and cute! I love this quilt, the colour palette is so soft and soothing! Which is nice for a change, bright and bold is super fun, but soft and sweet is sometimes just what the doctor ordered. I’m working on getting my family of 5 ready for 1/2 of us to go on vacation and the other 1/2 to go to grandparents. Will it be less work to be on vacation with only the oldest child? I’m hoping so! Thanks for the opportunity to win fabric. These are lovely soft tones- great scraps for a little baby doll or some little fun plush toy. I vacationed in VT the first time last fall and fell in love. Lucky girl you are to live there! We just moved from southern California to central washington state, so now in excited to actuall live in a place that has beautiful foliage. Have a great week! What a beautiful line of fabric! I love how you featured it with the wonky strings. Gorgeous! 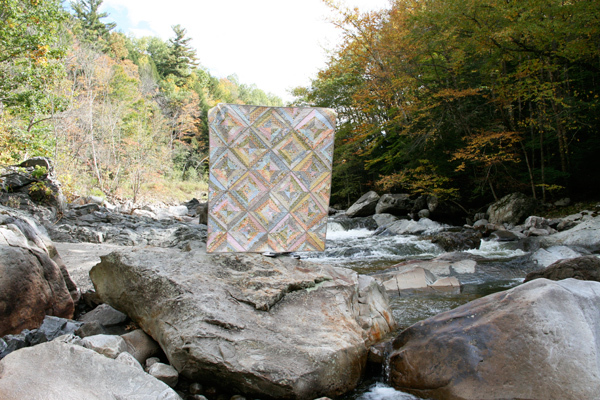 Beautiful quilt photographed in a beautiful location! It reminds me of my grandparents cabin on a river in Colorado. I went to the Seattle MQG this weekend and started the McGuffey quilt from the Schnibbles times two book, I love it. Thanks for the chance to add this fabric to my stash. 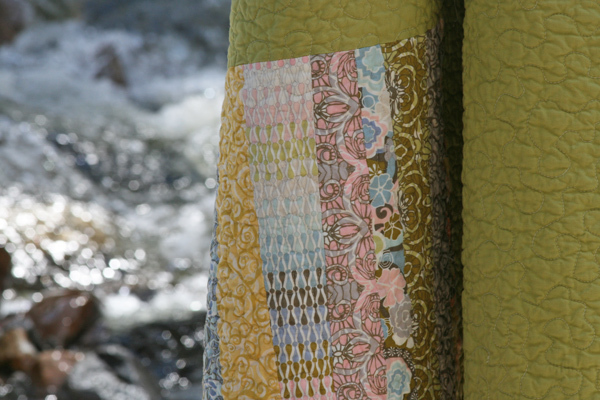 I love the soft colors in this quilt – beautiful line of fabric. Currently I’m working on a zig zag quilt for a bed in a spare room. I love the subtle colors in that quilt. Just gorgeous! This week I’m working on my UFO pile. I have 3 or 4 quilting projects to finish so I can start a couple of Christmas gifts. Just gorgeous! I wish I were able to make it to Market this month to see it in person, alas I can’t but am hoping for SLC so I hope you have one there too! Right now I’m working on a couple of top-secret projects so I can’t share. I also love looking at the fall foliage and just headed up north for Thanksgiving where I managed to get some good shots of the leaves! I love the softness of those colors! Oh, what a beautiful line of fabric! Those scraps would be so fun to play with. I think the Ash is a perfect choice. In the desert, Fall is our Spring. I am spring cleaning…planting the fall garden…and we all go out on the patio in the morning and play!!! No burned feet…or sweating or loud hum of the air conditioning!!! LOVE these fabrics- like sun-faded bohemian gems. massive clean up – clean out this week! I’m loving the muted colors – totally different for me! I’m finishing some potholder gifts (Rowan coffee cups in the center of wonky log cabins), knitting a sweater for hubby, and knitting a lace shawlette/scarf to wear to a wedding the end of this month. Lovely quilt! Lovely fabric! I’m pushing all my other sewing projects aside so I can work on Halloween costumes. The seven year old girl wants to be Jack Skellington (from the Nightmare Before Christmas). He wears a tuxedo! And the five year old wants to be Sally the Ragdoll. Turns out making a pieced, patchwork dress is harder than just making a lovely dress. Sometimes I wish I could be the mom who shops at Target for Halloween costumes, but really, it was Halloween three years ago that got me sewing again, so I should be thankful. Love this line! This week I’m working on a baby quilt for my soon to arrive nephew from assorted blues, greens, yellows, and browns. Love these colors! This week I am working on cleaning my studio (gasp!) and also making some potholders based on your string theory piecing method. Gotta use up those scraps! The quilt is beautiful and so is the scenery behind it! Ooop â€“ I forgot to say what Iâ€™m working on this week. Itâ€™s not really a fun sewing or craft project. Cleaning the house â€“ yuck! I love your newest quilt. Those colours are beautiful and the backing works perfectly. I am working a queen size windmill quilt for us – the first time in forever I am making one just for us. It is in colours I would have never chosen even two years ago. It is amazing how your taste changes. I just finished putting the binding on a quilt Saturday.. yahoo for me. I drafted the pattern from a photo of a quilt I took…of course I had to make a few changes to make it mine. Very nice! I’ve always wanted to make a strip quilt like that. I’m working on quilting a square-in-square quilt right now (and probably will be for a while!). Would love to win the scraps! Wow! I love this quilt! Thanks for sharing! The colors are gorgeous and I love the string quilts – I need to try one someday. A favorite fall activity is going for a hike with my daughters and husband! WoW!You were spot on picking the design for this collection of fabrics. It blends so beautifully with the gentle colors of the prints. Love it! I was sick last week so didn’t get to finish up my AMH Little Folks quilt like I intended…then after trying out fabrics for the binding, I decide I want to add a border around the quilt. So that’s this weeks project. We’ll see. Love the soft colors in this collection. Around here a favorite fall activity is taking a mountain drive to see Colorado’s beautiful aspen trees turning to gold. I love these fabrics! I love fall weather – windows open and lower electric bill! Thanks for the nice giveaway! I am currently working on a quilt for my Mom’s 60th birthday next month. Love the soft palette and your choice of the stone for the outlines and binding really sets it off nicely. We love to go to a local farm and buy pumpkins and gourds to decorate the house. I love this new line. At the present I am working on finishing a quilt using Picnic Parade. I am sewing a table runner, for X-Mas decoration! Love the colors! This turned out beautiful! WOuld be priviledged to get the scraps 🙂 I am working on a Nicey Jane quilt with a Kona back in butter yellow for my mother for Christmas! Just another beautiful quilt from you. *S* You make it look so easy. I’m working on my UFO stack of flimsies this week. Right now I am sandwiching an hourglass quilt. You are so right about the soft colors here. Makes me want to sit and have tea and scones. I am a beginner quilter and am attempting to design my first quilt using Opal Owl. I adore the soft colors in this line! I am working on some pjs for me this week, and I am hoping to make some little pants for the baby! Love this new line of fabric! And it lends itself really well in a string quilt. I like many of the brighter pallets, but I’m really loving these soft tones. Your choice of solid colors to use in this quilt are great. I’m not working on anything this week, and don’t think I could for a number of weeks. I’m planning on visiting an apple orchid, maybe this weekend. Enjoy checking out the foliage in VT; it’s gorgeous there now! I’m in TX, and even though we do have a Fall here, many trees stay green, except some. Our Fall foliage is not even comparable to your area, or say CO (where I used to live and miss!) As of now, we still need the AC during the day here! the new quilt looks super…love the overall softness. im currently working on a quilt for my nephews birthday..in a few short weeks! must get busy! This is gorgeous…the fabric and the quilt. I got a start on a new quilt this weekend, using scraps and natural linen. I think I’m hooked on the combination. I’m in desperate need of more scraps, so fingers crossed for me. Picked apples in the mountains yesterday. It was fun, but a bit too hot to really feel like a fall activity. I hope it cools off again soon. I love to go hiking in the fall (and anytime)so I especially love these pictures, love to read your blog, and I’m currently working on a flying geese quilt that I started 10 years ago! I’m also making some little origami bags and playing with the “blendable curves” ideas from Peggy Barkle’s book of the same name. Congratulations on your baby news! Your tutorials are GREAT – thanks so much! i’d love to win those wonderful bits! I really like how subtle these colors are, and your quilt is just lovely! This week I’m working on reorganizing the kitchen cabinets, hanging up some pictures, and trying out some new recipes. Not very quilty, but I guess that’s just how it goes sometimes. WOW! That is one GORGEOUS quilt! I’m now in love with the fabric and must have some! Winning some to play with would be a bonus! Thanks for a lovely opportunity! Reorganizing the entire house and a few baby quilts. Thanks for offering the giveaway. love the quilt! I think I know what I will do with some scraps I have sitting in a pile. I hope to actually get my daugther’s Halloween costume made this week – she is a “witch-bee”. I guess when you can’t decide, go with both. This quilt is great Ashley! And I love that Morgan helps you get all these great shots of your quilts. I’m currently working on a quilt for my Father in Law for Christmas, and a quilt I named Freshcuts Square Dance (using Heather Bailey’s Freshcuts line and AmandaJean’s most recent quilt along) Fall is by far my favorite season. I love the smells of pumkin spice that seams to be everywhere right now. that fabric is gorgeous! as is that river! i am knitting my little girl’s halloween costume and finishing a mini quilt! then i am focusing on ufos until the stack is smaller! thanks for the chance at these great fabrics! Out here in California, I’m in the middle of a wonky string quilt (yummy bright but grounded fall colors, oranges and greens and blues and browns) for a friend — I’m going to start making more of these, especially for my single women friends (just because we don’t have weddings and baby showers doesn’t mean we shouldn’t get beautiful quilts!). Your tutorial was spot on, and this has been so fun to make. And yesterday I finished a baby quilt with pinwheels. I’m on a pretty limited budget, so both of these were made with fabric scraps or whatever I had at home. It’s amazing what color combinations end up looking wonderful together because you’re working with what you have. Thanks for the continued inspiration. more fabric to have to choose from…! i am trying to find a job, still. and watching the snow fall. it’s winter here in alaska. It looks absolutely beautiful but then I am alread in love with Jenean’s new fabric line since I saw the sneaky peek on her blog. The pattern is a marvellous showcase of the fabrics and the toning centre squares and backing are just perfect. Activities this week? Boring stuff like making curtains, embellishing a little wall hanging and quickly making some small bags for our quilt show bag tombola over Halloween. What lovely fabric! I’m currently trying (desperately) to finish a baby quilt for a friend whose daughter arrived a few weeks early! Working on dresses for granddaughters and also itching to make some fall table runners and halloween decor. New fabric lines always inspire creativity! Absolutely beautiful design showcasing equally gorgeous fabrics. I’ll admit I’ve been in love with Wild World since Jenean previewed it on her blog and your choice of toning fabrics is spot on in complementing the collection. This week? Boring stuff – embellishing a wall quilt, making bags for the quilt show bag tombola and a brooch for the butterfly challenge in the group. This week, I will be working on my fall tree block with my hand and my kids’ hands for trunks. It’s one of my quilting bee blocks for the month. Also hoping to get to the pumpkin patch this weekend. Seeing your quilt makes me want to stay in and quilt! Today I am going to hike the Douglas Fir trail – a wildnerness trail in the heart of my city – with a friend and my son. It is a bit grey and over-cast but I am hoping the fall colours on on the trees will be inspiring. I’m working on a grey, blue, yellow, and green quilt at the moment, inspired by a fabric with all these colours in it. Also knitting a scarf for a gift in soft browns and greens. Gorgeous new quilt…the soft color pallette is a nice change of pace. As always, I love the string quilt pattern! About to finish a quilt for my next door neighbors! Thanks for the giveaway! I’m working on some Christmas quilts for my mom and mother-in-law in between sewing Halloween costumes. Love this quilt of yours and the fabric! Beautiful! beautiful! you never fail to inspire! i am working on putting together a sewing station and organizing all my things before i am allowed to sew anything! would love to have those scraps to start something fun! I love this line of fabrics! they seem so fresh & new, yet work really well with traditional taste, too. Beautiful quilt! Such a beautiful line of fabric and what a great quilt! I am currently working fast and furious on aprons and bibs for a holiday market. What a generous giveaway! Ohhhh! This is the prettiest fabric I’ve seen in a while!!! The quilt is beautiful! I love how you photograph your quilts! I would love these fabrics for the quilts I have planned when we move house in three weeks. My favourite Autumn thing is leaves! my favorite fall activity is driving through the canyons to see all the lovely autumn colors! Such beautiful fabrics!! Right now my project is sewing Halloween costumes for my 4 boys – although I’d rather be hiking through the woods! I love listening to rain on the roof in the fall. 🙂 COZY!! I love those fabrics – so mellow and cosy! This week I will be mainly sandwiching a quilt top I made months ago that I have decided to give it to my in-laws for Christmas. And eating chocolate. I’m wrapping up a Anna Maria Horner voile scarf giveaway this week, so I’ll be making 2 scarves. I’m also working on adding the binding for my little boy’s 1st quilt! Then it’s off to the races to start cutting for a new quilting project. Love you blog and your string quilts are inspriational! I’m gonna give one a try using your tutorial here soon. wish me luck. darling! on the docket this week- finally putting husband’s quilt together (or at least attempting too…) and cutting strips for my daughter’s quilt- both christmas gifts that i need to get going on! This week I am working on finishing up a star sampler and cutting the blocks for my sisters christmas present. However, I think my next quilt is going to be scrappy string quilt. Love these colors! so soft and pretty. I’m working on my very first quilt this week. It’s actually 2 I-spy quilts for my 2 boys. I’ve cut most of the squares now just have to decide what solid to pair the squares with. Thanks for the giveaway! Beautiful fabrics and a lovely quilt. I’m working on my first skirt – have been quilting for a while but am feeling the urge to try clothes making. My in-laws took ALL FOUR of my kids for the ENTIRE WEEK!! I have a to-do list a mile long (and have started NONE of it!). Lots of sewing projects on the list, naturally. I’ve also sworn to finally open my Etsy shop. Heck. I may even take a walk … by myself!!! Oh please, please pick me! I’m working on the QAYG Quilt-Along and my stash is just so sad. Plus, I just love Jenean Morrison’s fabric. Thank you for offering this giveaway. I love your string quilts! Thanks for the inspiration and the giveaway! I am working on quilting a baby quilt for my best friend who is due in Nov. I love how her colors work together. And they come off so peaceful. Love it and would love to play with it! This week I’m working on using my my Arcadia to make something snuggly for the couch. It’s getting to be Fall and that means snuggling on the couch. Wow! Usually I’m not drawn to the “quiet” quilts, but this one is beautiful. I love those fabrics as well – thanks for the opportunity! I hope to start a pinwheel quilt using Moda turnovers….need some fast, easy quilts to use for practicing long arm machine quilting – & winter is on the way…what better reason than that? LOL. Thanks for a chance to win! I love to go festival hopping in the fall. It seems to me that fall is prime festival season. Great quilt! I absolutely LOVE those colors! And string quilts have got to be my favorite. Nice! What a lovely quilt! I am going on school camp today here in Aussie springtime to the beautiful Grampians in Victoria so my craft is on hold til I return! What gorgeous fabric! My favorite fall activity is definitely apple picking and playing at the farm. Beautiful. I’m working on my oldest son’s quilt right now. I’ve pieced the whole quilt and now I”m hand quilting. Hoping to have more time to work on it tonight. Today though we enjoyed the beautiful autumn day and went to a corn maize. Lovely setting for the pictures, but you would have to pay me to get me to climb on rocks in the middle of the river. I am working on Halloween costumes for my 2 granddaughters – a witch and a skeleton, a maternity top for their Mom and planning a baby quilt for #3 as soom as we find out if we will have a boy or a girl. beautiful quilt!! right now i wish i could say i was working on my mom’s quilt but it is just sitting on my dining room table untouched. I’m working on wonky cupcake blocks…trying to get 60 done for a friend’s ‘significant’ birthday. These fabrics would be great! Altho I too, like to travel VT backroads to look at foliage, the house in Chester is closed up and we are back in Seattle watching rain instead. Congratulations on your new quilt AND your new ‘production’! I should start working on my Lady Gaga Halloween costume but instead I have started a bunch of random projects. Oops. My favorite fall activity is crunching through leaves and everything about Halloween. I usually an not that attracted to more muted colors, but these are so fun! This week I’m working on an applique mural for a group art project – it’s way outside my comfort zone, but I’m having a lot of fun with it now that I’ve gotten started! Your string quilts always turn out so nicely- someday I will get around to making one too! I love the colors in that quilt! This week I am working on a “Donkey Kong” red tie for my 5-year old grandson’s Halloween costume! I’d rather be quilting–but who can turn him down! What fun that you have all these comments! I would love to be the beneficiary of your giveaway. What fun it is to get scraps (the sign of a true quilter-at-heart). This week I’m hoping to finish up a quilt for my 5 year-old nephew’s birthday. It’s an assortment of blues, oranges, and plaids. In fact, two of my husbands shirts made their way into the patchwork. Congratulations on your exciting expectancy and I’ll be following along with your doings! Oh, these prints are great; very soft and subdued feeling. I have three baby quilts that i need to get cooking on! Beautiful quilt and wonderful fabric line. Working on a few quilts and couple potholders I made up to try out my Minelli binding attachment I bought at Seattly quilt expo 2 YEARS ago! and Iâ€™m just playing with it trying to figure out how to use the thing. I donâ€™t like to handstitch binding but I love quiltsâ€¦so bought this. But Iâ€™m not sure itâ€™s gonna work out. Itâ€™s pretty tedious, I almost should just spend my hrs perfecting, and learning to enjoy traditional binding. 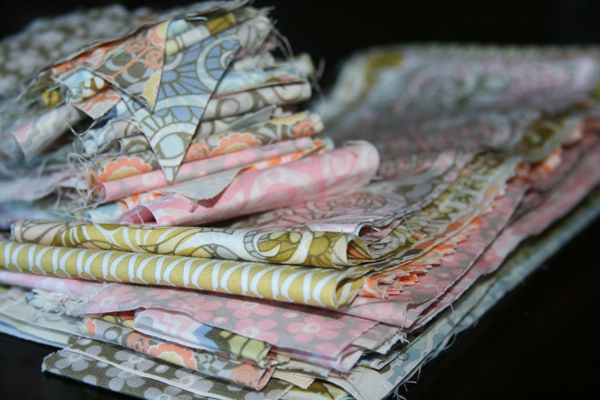 ANYWAYâ€¦would love those pretty scraps;) As always, LOVE your beautiful quilts! I love apple picking (and then making apple butter), pumpkin patches (and pumpkin butter) and all that fall fun stuff! I am working on 2 halloween costumes this week. My 5 year old needs a Dorothy dress and I’m making a “sack of money” for a friend of mine whose sons are going as a cop and robber and her daughter is going to be the sack of money… too cute! Gorgeous Fabric and Gorgeous Quilt! I’ve been working on a couple of baby quilts this weekend and I finished up a Christmas quilt too! Buzz Lightyear. To Infinity, and Beyond! I’m busy with my “Yankees Pinstripe” quilt, a simple one of my own design. I hope to have it pieced by the time the Yankees win the pennant! These fabrics are really beautiful! And of course the quilt you made is just stunning! I’m working on a winter quilt to snuggle under with my coffee in the morning! Wow that’s lovely. The stone was the perfect border. I am currently working on 2 quilts… one for my husbands mom. He picked out the fabric and laid out the random squares. This one is a fun collaboration. The second project is a quick baby quilt. This is my first fall in Hawaii and I am missing the change of seasons. No fall leaves for me this year! Beautiful quilt. I am huge fan of string quilts. My favorite fall activities are collecting leaves on our walks to school for the fall wreath we make every year and taking the kiddos to the pumpkin patch. I just love how soft and lovely these prints are! Gorgeous fabrics and don’t they look lovely made up in your lovely pattern? It’s springhere in Aus, but my fav fall (or autumn to us!) activity is walking along the river catching the last of the warmer weather. Beautiful quilt, can’t wait to see the line in person. And touch it, and fabric fondle it – LOL. I am working on finishing my first free motion quilt. I’ve pieced several, but this is the first using the machine to do the quilting. Can’t wait to finish. Best! I am working on a patchwork block quilt for my daughter. Many of the fabrics are from leftover fabrics from her old dresses, so it is really fun. I keep thinking I need to make a string quilt next. They look so wonderful. WORKING ON A NEAT WALL HANGING OF ONLY REDS+WHITES OF A BASKET BLOCK-SO FUN! THANKS FOR SHARING! Love the muted colors of this line! I always seem to make quilts out of brightly colored fabrics and would love to try working with these softer colors. That middle of the river shot is great! And scraps! This week I’m working on patchwork bags made with scraps from my mother’s potholders for the church bazaar project and my dad’s pillowcase projects. I love scraps! I like where you chose to photograph the quilt. It really brings out the tones of the quilt! Wow-that is one beautiful quilt! Love the colors in this line of fabric…very soothing! Working on some Thanksgiving table runners right now! Lovely quilt and lovely colours! I would love to win the scraps! I am about to go back to work on my Tokyo Subway Quilt-Along (Oh Fransson!) – I think I’m 6 blocks behind so I shouldn’t be reading blogs! Thank you! love love love your colors! 🙂 hopefully i’ll win the scraps! yay! thanks!! Amazing fabric, fantastic quilt! I love it, you did a great job picking the perfect way to showcase the fabric! I am working on a doll quilt for a swap, it is turning out better than I thought it would (and now I want to keep it, LOL). I have a quilt for kids kit waiting for my time and a top that I should have quilted this weekend. That could all stay on hold if I were to win such lovely scraps! I love the soft colors in this one! I’m working on the binding for my first string quilt. Lovely quilt! My favorite fall activity is making soup! Of course, it needs to actually get cool first! This week, I’m trying to finish piecing a quilt top that got its start in a class I took recently. In it, I learned about sewing curves in a more organic way than I was used to (old way: pinning and fussing; new way: go with the flow). The class model was inspired by Amish quilts, but with a modern twist. I’m just a seam-pressing away from the last step of piecing the top and can’t wait to see how my interpretation turns out! A lovely quilt. I love the gentle colours and String Quilts are my current passion. Great Giveaway, please count me in! I’m working on a jean/corduroy quilt for a wedding gift for my cousin. I’m off to buy a backing fabric for it tonight. Gorgeous gorgeous quilt! I love the soft colours! This week I am finishing handstitching the binding on a quilt for my mum 🙂 thanks for sharing! I love the soft colors in this quilt. I didn’t know about this line so I’m happy I got to see it. I am working on a binding for one of the charity quilts the KC Modern Quilt Guild will be giving to to a NICU this month. It’s in such fun colors (oranges and blues). I can’t wait to get to it! I am working on a baby quilt out of a reclaimed flannel blanket. How sweet! Love the fabric. Love the new fabric line. I’m working on a challange quilt for my SewMod group, 9 rows of different blocks. I’m into making pincushions at the moment. These scraps would be delightful for that. Hi Ashley, Jenean’s quilt is gorgeous. I’m working on a string quilt too at the moment. I’ve set myself a scrap challenge. I do love how string quilts from the same fabric line look though….perhaps that’s something for later. Thanks for the inspiration, as always. Lovely quilt, and a generous giveaway! I’m a huge fan of string quilts, and this colorway is unusual and beautiful. This week, I’m working on a Classic Pooh themed baby quilt for an upcoming shower. It’s a little out of my modern quilting comfort zone, but it’s a fun challenge. This week I am working on finishing quilts for twins; my daughter’s volleyball coach is pregnant!! You made another beautiful string quilt! I have made two from various scraps, it would be fun to make one with one fabric line. Wow, I would never be attracted to those colors in a store–but that quilt is magnificent! I love the backing fabric. That shot of the back make it look like a stained glass window. wow! this is such a lovely quilt and collection of fabrics! I am working on finishing up Halloween customes AND making zippered pouches as favors for my daughters birthday party. I bet those small pieces would be just perfect for a few pouches!! I am working on a quilt-along Judy Laquidara is posting on her blog, Patchwork Times. She calls the quilt ‘Note to Self’ because it resembles a bunch of Postit Notes. It is a fun quilt to make. I love the fabrics you use in your quilts. Those scraps are awesome! I could totally use them for something super fun. Right now, I am working on the Savvy Seasons swap goodies, but I am getting ready to start up all my holiday fun! Thanks for such an awesome giveaway! This quilt is beautiful. I normally like brighter colors but the pastels in this one are really amazing! Love the collection. What an interesting soft palatte! I’m trying to keep steady progress going on my own string quilt, but I’m having trouble because I’m running low on material – I’m only working with scraps. Please help me out! Beautiful fabrics. This week the hubby is on holidays so we will be doing some house projects and lots of outdoor stuff with our 2 year old. I will sneak in some sewing though too! This week I’ll be working on a couple of onesie dresses and burp cloths. Oh, and its the last week of studying for my peds boards so I’ll be doing that too. Fun times. Love that quilt! I’m a Maine girl, so I totally get the love for New England foliage. Beautiful quilt… lovely, soft colors, almost like sand. Right now, I’m finishing up a few things anticipating the arrival of Liesl Gibbons new City Weekend which I ordered last week… can’t wait! Hopefully it will inspire me to get going on some holiday crafting! I love how you used just the right sizes of quilts. Perfect! That’s looks incredible, and unique! I just finished an autumn table runner, and I’m working on putting together my Mod Bento boxes and a vintage quilt which needs sandwiching. Thanks for the chance. I always love your string quilts…my only attempt at one was an utter failure. Would love to have the fabric scraps! I’m trying to get a jump start on some Christmas gifts this week…well, and for many weeks! This is beautiful, I love your string quilts! Great pattern choice for the fabric! I think I will attempt something similar with some fabric I’ve been saving for something spectacular. Awesome baby quilt, if you ask me! Hope you are feeling ok.
Love the fabrics and quilt! I’m making a bunch of fabric pumpkins, the are turning out sooo cute. what a beautiful quilt and what beautiful fabrics! – Projects I’m working on: I was finally bitten by the Hexagon bug. I thought the whole process might be a bit too fussy for me, but then I tried it and I was hooked; I realized I could take them anywhere (including in front of the idiot box), and what a great way to use scraps! Beautiful quilt. Really like the colors. We have a busy week off from school planned here. It includes a lot of sewing (aprons, bag, & skirts)and quilting and craft projects and getting outdoors to enjoy some lovely fall weather. I love the string quilt. It was the first quilt I made and did it with your tutorial. I love the fabric too. Right now I have a partially worked on string quilt for a baby. It is taking me a while. I just finished a quilt I gave as a wedding gift, so I am taking this week off! I hope to win- these are just beautiful fabrics! I enjoy leaf peeping from a plane. I am working on a scrapy, pieced, fabric book and necklaces made from thrift store t-shirts. I love the use of grey for sashing on your quilt. What a beautiful place to photograph such a beautiful quilt! Such lovely scraps! I’m working on Halloween costumes this week. Just got a new sewing machine today (the old one died a slow and painful death), so I’m all set to go! Oh I’d love to be picked! The fabric is beautiful…even small scraps. those fabrics are just so pretty!! although its not crafty- i am working on sleeping this week!! i had a baby boy on monday, and am busy catching up, and adjusting to being a mamma of two!!! I’m finishing a knitted dress that I’ve been working on for a few months, designing a self portrait quilt block and hoping to get to a small Halloween table topper. Fall is fun. The leaves are starting to turn and I love it. Your quilt is lovely…as usual. Thanks for the giveaway. love…LOve…LOVE this fabric. working on two new baby quilts for two new nephews. i love fall. i love photography the beautiful scenery in western washington AND i have to admit, i love…LOve…LOVE football. Baeutiful. I’m working on some Christmas items for a Flickr swap I’m in! I’m cutting out pieces to start a jigsaw puzzle quilt! I’d love to incorporate your scraps into my project….thanks for the opportunity! Love the colors of the fabric, and the quilt is beautiful. Well done! 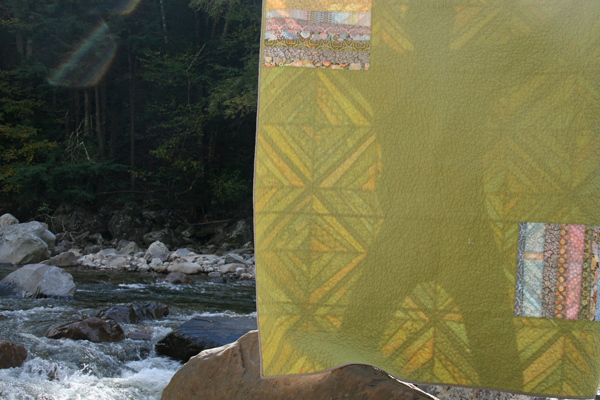 Oooh, that is a beautiful quilt and such lovely fabric! And to make some available to us? Fabulous!! I have just tonight finished a very whimsical quilt for our quilt ministry, and I’m also piecing a top for a housewarming gift quilt, also for the quilt ministry. Hopefully I’ll get that one finished this week also! What a wonderful quilt and photoshoot! I’m going to be starting a new quilt this week. Please enter me in the contest. Right now I’m working on a case for my Grandma’s new Nook! Love your quilt (as usual). This week I’m still fighting with my machine over its tension settings. One of us is going to have to take up yoga. You have such an eye for color placement. I love, love this quilt. Wish I could see it in person. Wow, Ashley, I can’t decide which is more beautiful â€” the quilt or the photos! I guess I don’t really need to decide, though. Amazing work, as usual! your quilt is lovely and i love the muted soft tones of the fabric. would love to get my hands on those lovelies. This week I’m working on a shirt for my dad. He likes shirts made with novelty prints so I’m making a Halloween themed one with little sparkly ghosts for him. I plan to finish it by the end of the week so he can get some wear out of it this year! I am working on too many things to list ;o). I love to sit on my porch at night and listen to the (almost) quiet. Love the quilt and the fabrics are fabulous! I’m just finishing up a bow tie quilt – inspired by one you did! Thanks for the giveaway – and the quilt is great. Your work is so lovely! This latest quilt is wonderful, such soft, yet colorful fabrics. These will be a MUST HAVE for me. Thanks again for all your inspiration. The setting of the photos is perfect with the colors of the fabrics. I am making two Halloween doll quilts for my kids. Thanks for the chance. I’m a NZer living in Adelaide in Australia and I’ve recently discovered your blog, which has really inspired my quilting; (along with the world of links to other blogs)- there’s a whole new world out there! I’m in the midst of making an Ashley inspired string quilt for my sister’s 40th. Wow gorgeous soft colours! I am working on an Oliver and S Icecream dress for my daughter. I am collecting scraps from her clothing to make her a string pieced quilt. So much sentimentality! the quilt is beautifully serene. i’m working on halloween costumes for my sons…quilts…advent calendars…bow ties…but mostly (right at this moment) procrastination. thanks for the chance to win the lovely fabric! What a gorgeous quilt! I love the silhouette photo in the river. I’d love to see this quilt in person. The colorways are sublime. Thanks for the opportunity to win the scraps! Fabulous quilt! I’m clearing a room which is going to be my sewing studio. Can’t wait! Love those colors! My favorite fall activity is going to the pumpkin patch! I love the soft colors in this line it seems very soothing. This fall my husband and I have started riding bikes. We love being outdoors it is so much fun. love those stone colors…. I’m going to have to check out her booth at quilt market… great job on the quilt! Wow – I love what you’ve created with this line. I’ve been working with so many bright colors – this palette is a refreshing change. I love leaf peeping, too, but the foliage around my part of Vermont isn’t great this year. Saw some really nice color in southwest VT, though. Lovely! I’d love to win these!! I’m frantically trying to finish a baby quilt for an upcoming shower PLUS my husband’s quilt. That is just beautiful and looks so cozy! I would love to win these fabrics. I am trying to build up my stash as I am a new quilter. Love the fall- especially the cooler weather in NC after such a hot summer. I’m trying to work on a cute baby quilt. I love the new fabric collection! I’m working on my first square for my first bee. So exciting! I love these colors and the patterns! Fabulous prints! Fabulous quilt! Fabulous river background! This week I am working on finishing 5 baby quilts (tops are done, now need to quilt them) and making gingered pear preserves – it finally seems like fall down here in Florida. I am still working on my first quilt! Taking a little while, but I love it! And of course, I am working on aquiring fabrics for a bunch of quilts I have not even started! I love the quilt! This week I’m working on getting my craft room straightened up so I can repaint it. Then, I have to finish quilting a quilt that I made for my mom. Beautiful quilt. Love the subdued colors of this fabric line. My favorite fall activity is anything outside – hiking, biking, yardwork. I just love the smell of the crisp autumn air! Pick me! That is truly a lovely quilt. I love the stone choice – works beautifully. As for what I am working on, having finished my first quilt ever 3 weeks ago, I am pulling together fabrics for a new quilt for our bed. I have some scraps in my bag to hit the local quilting shop with today to find some additional colors. Very exciting. Thanks for your inspiring posts and beautiful quilts. Love the quilt. I’m trying to finish a baby quilt for a friend, hopefully I can get it done before baby arrives this week. Beautiful! I would love to win the those gorgeous leftovers! This week I am whittling down by Christmas gift list by piecing a blue/white quilt for a friend. This is so pretty! Our favorite fall activity is going apple picking. Now I need to look up recipes to use up all my apples! This week, like every week until Christmas is dedicated to finishing up some projects that I would ideally like to give as gifts. Christmas just sneaks up on you so I’m trying to be proactive. Those are beautiful color combinations…great job! I like to take leaf watching drives in the Fall, too. Favorite fall activity – walking in the leaves. This week I am working on my 3rd ever quilt for my daughter, and aspire to one day be able to make quilts like yours! Thanks for the inspiration!